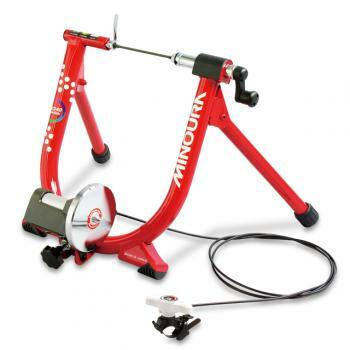 The Minoura LR340 turbo trainer is one of Minoura’s LiveRide trainers that use and Advanced Magturbo resistance brake. The original Magturbo brake was the first ever magnetic resistance brake on the market, and the Advanced version used on the LR340 is more powerful, quieter, and offers a 35% wider resistance range. 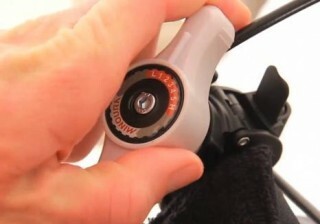 The LR340 has a 1.1kg virtual flywheel and its resistance is set and modified via a handlebar mounted quick release resistance lever. This trainer can generate 433 Watts and 672 Watts of power at training speeds of 40km/h and 60km/h respectively. As with all LiveRide models the LR340 is compatible with various apps to enhance your workout experience. These include the Live Training, Sufferfest, and Cogmon that allow virtual courses, films, and analysis to be followed during a turbo training session.